Have a fun afternoon making homemade graham crackers with the kids, and get all the best tips and tricks to make sure they taste as good as they look, too! Can you believe it? This recipe took almost two years to perfect, and I nearly blew it with the pictures. You see, I mistakenly planned to photograph the crackers after an optometrist appointment, and apparently forgot that my eyes would be dilated. Oops. Even though I was able to drive back safely, seeing fine details on the computer and camera screens was out of the question. So, I had no idea whether or not most of these photos would actually turn out okay. So, what do you think? 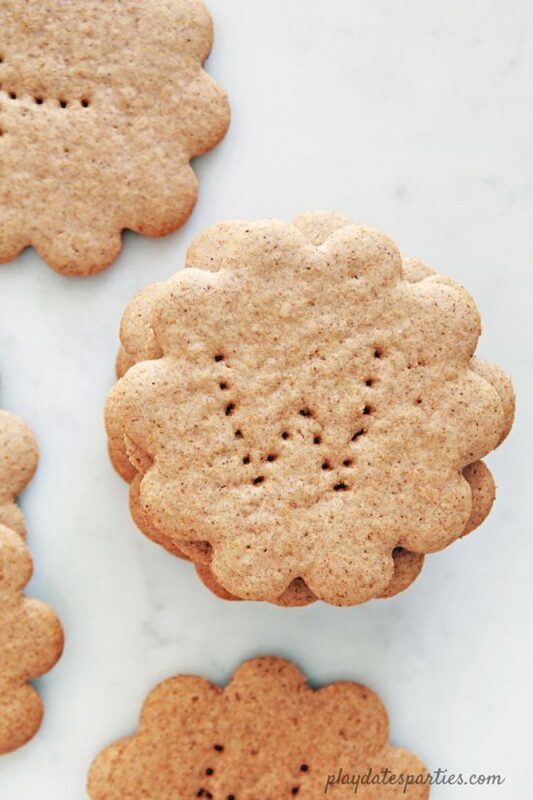 Do these homemade graham crackers look as good as they taste? Why Make Homemade Graham Crackers? The idea of making homemade graham crackers first came to me when planning my littlest one’s s’mores themed first birthday party. It just seemed like a fun way to make a simple party more personal. But, parties aside, making graham crackers side-by-side with your kid is a fantastic way to introduce whole grains and healthier eating habits in a way that is fun and approachable. Plus, the kids get just as excited about making homemade graham crackers as they will about making chocolate chip cookies. And I think we all know which is better for them. There are dozens of recipes out there for homemade graham crackers. And they vary widely. Some recipes use honey to sweeten. Others use sugar or molasses. Even the proportion of dry to wet ingredients seems unknown. Honestly, the first few recipes I made were horrible. They were bland and dry, but not crisp. It was so frustrating, that I almost gave up. But finally we found it! After nearly two years, we finally found a recipe tasty enough that my kids agree is better than store-bought. These homemade graham crackers have just the right amount of sweetness. Yet, they are full of flavor, thanks to the addition of cinnamon in the batter. Let’s be honest, the kids also like it because it’s egg free – which means they can taste the batter right out of the bowl! Forget the boxed version! 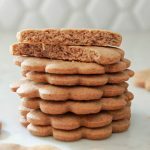 Homemade graham crackers with cinnamon and honey are a delicious alternative to store bought crackers, and a perfect treat to make with your kids. Combine whole wheat flour, all-purpose flour, baking powder baking soda, cinnamon, and salt in a large bowl. Stir with a whisk to combine and break up any lumps. In the bowl of a stand mixer, cream together butter, brown sugar, and honey until light and fluffy. Add dry ingredients into the creamed butter, one or two spoonfuls at a time, mixing on low to combine. Add vanilla and small splashes of milk between spoonfuls to keep the mixture moist. When ingredients are well combined, divide dough into 3 balls, slightly larger than the size of a fist. Preheat your oven to 350F and prepare a baking sheet with parchment paper. 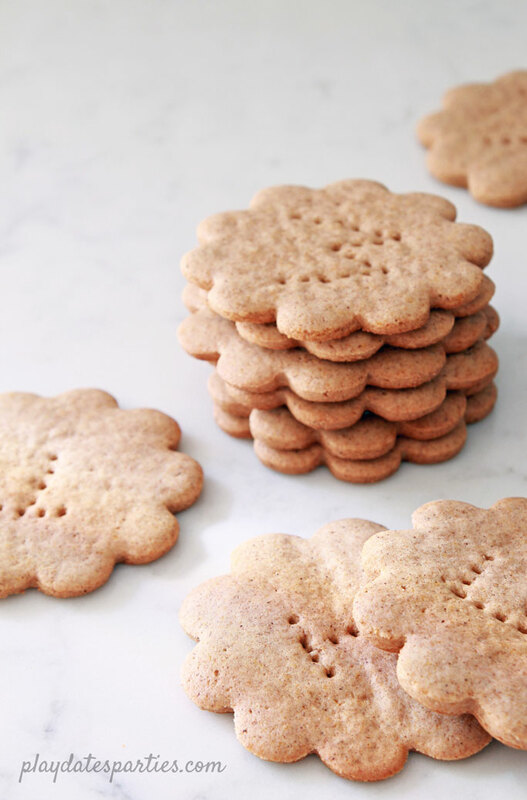 Use cookie cutters to cut out graham crackers in your desired shape and pierce the center with a fork. Alternatively, use a pizza wheel to cut the dough into a 5x15" rectangle, and then subdivide into smaller rectangles. Use a fork to pierce the rectangles. 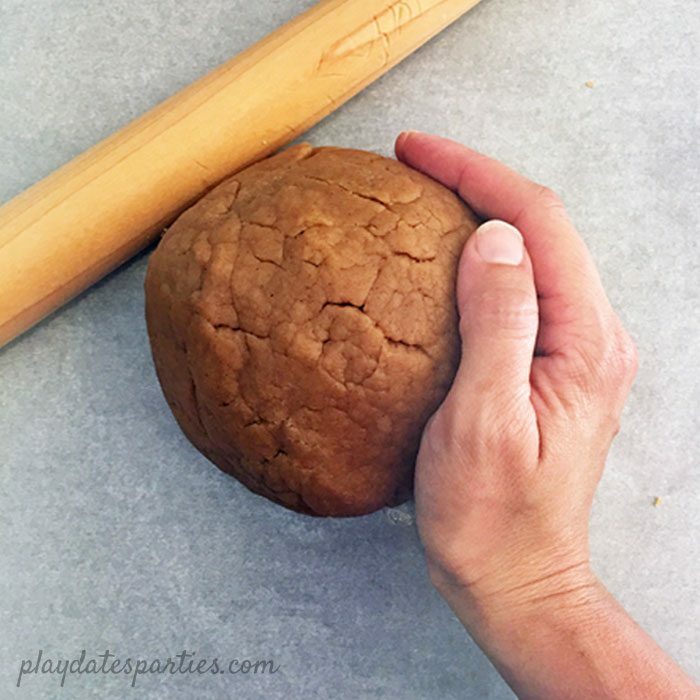 Re-roll and cut the dough until all the dough is used. Bake in preheated oven for 8-15 minutes, depending on the thickness of your crackers. Rotate the pan 5 minutes into the baking time to ensure even baking. Remove crackers from the oven just as you start to see the first edge of your crackers turn golden brown and the tops are no longer sticky. Because of the quantity of honey, it can be difficult to get a truly crisp cracker. They are delicious soft and chewy, but to get a crisp cracker, make sure you roll your dough out as thin as possible. Anything 1/4 inch or thicker will have a chewier texture. You may also need to let the crackers air out for a day or two to really crisp up. Piercing the cookies with a fork is a great way for little kids to practice learning. 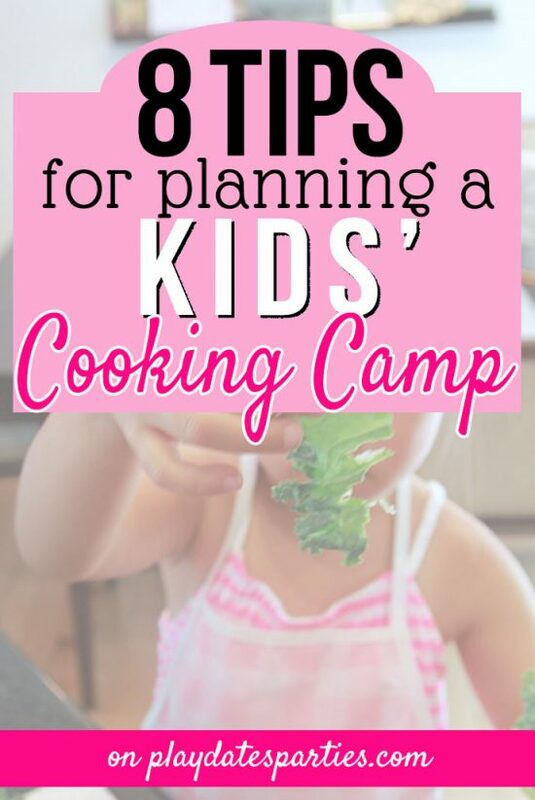 Have them try making letters, numbers, or shapes with their fork. Rolling the dough between sheets of parchment paper helps to reduce the risk of adding too much flour to the mixture, which will ruin the flavor and make the crackers too tough. These graham crackers are flavorful enough without it, but you can sprinkle cinnamon sugar on top before baking for an extra sweet snack. Grab your kids and make some homemade graham crackers of your own. The kids will love being involved in a fun baking project, and you’ll love that it’s full of both flavor and whole grains. Have you ever made homemade graham crackers? 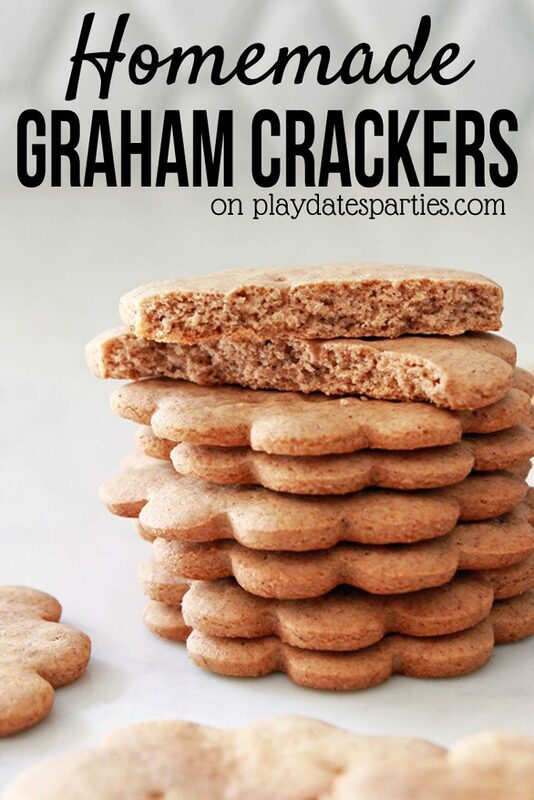 These are so cute and I would love to try making homemade graham crackers in the future. I bet they are better! Thanks for sharing! What a great idea! You can control the amount of sugar this way and so much fun for the kids. Thanks for sharing at the What’s for Dinner party. 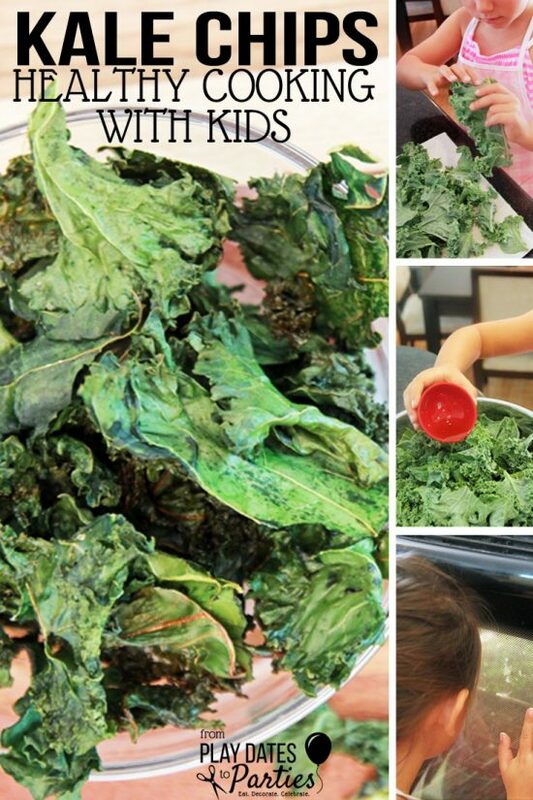 These look like a nice, healthy alternative as a snack for kids. I’m going to pin it for you. I’m from the Over the Moon link party. These sound amazing. I don’t think we have graham crackers in Australia, I’ve never seen them at the supermarket. Love doing homemade graham crackers! I need to make some, I’ve been out for a while! PLUS the smell is to die for. My brother-in-law was over while I was making them, once, and he couldn’t stop talking about it. They look amazing. I can’t wait to try them. I would never have thought of making graham crackers and it’s a bonus if you include some kiddies to help. I love this recipe, it sounds delicious and a healthier option than many cookies. Your pictures are good, no worries but I know what it’s like to be stuck with dilated eyeballs. I am not a huge graham cracker fan but these look so tasty! Pinned. I made graham crackers so we could have s’mores when we moved out of the US – it doesn’t exist except maybe in an American store. Hi Leslie, I always thought Graham crackers were savoury. I think the word cracker threw me. Any biscuit with cinnamon is a winner, I’m going to have to try this recipe one day just to satisfy my curiosity! Graham crackers have been a go-to snack in our home for many many years. I’m looking forward to trying this recipe, thanks for sharing it with us! How fun! I’ve never tried making homemade graham crackers. Thanks for sharing with SYC. They look great! My kids love to make cookies, especially when they can use the cookie cutters. I love that you can eat the batter right out of the bowl – my kind of recipe! Looks delicious and fun! Thanks for sharing on Foodie Friday! I bet these are really good, and know my grandkids or even my teen would love homemade grahams. Thanks for sharing at the inspiration spotlight party @DearCreatives sharing. Looks like so much fun. Pinned – Great job and thanks for sharing on To Grandma’s House We Go! I can’t wait to try these graham crackers they look so yummy! Thank you so much for sharing this post on the Simple Homestead Hop, as one of the co-hosts I will be sharing your post this Thursday! Hope you stop by and share another awesome post! Your crackers look delicious! I’ve been thinking about trying to make my own, so this recipe is great! Saw you on Back to Basics and the Simple Homestead Hop!